Zang Tuum Tuum and Salvo – Union Square Music’s collector’s label – announce Influence, the definitive Best Of the Art of Noise. It will be released on july 19th. Disc One compiles all the hit singles plus collaborations, classic album tracks, movie & TV themes, 12″ remixes and B-sides. And Disc Two retells the Art of Noise story via 20 previously-unreleased tracks from all eras of the group’s history, from 1983 to the present day. 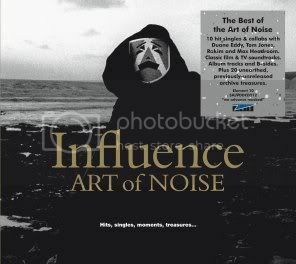 Influence covers all eras of Art of Noise’s ground-breaking contribution to sampling, dance and electronic music. From the early 80s with records like Beat Box, Moments in Love, Close (to the Edit), and as the band that put together Malcolm McLaren’s highly influential Duck Rock… To mid-80s hit singles like Peter Gunn (with Duane Eddy), Kiss (with Tom Jones), Paranoimia (with Max Headroom)… Art of Noise’s 90s/00s reincarnation – when founder members Trevor Horn, Anne Dudley and Paul Morley were joined by Lol Creme – is also covered with singles such as Metaforce (featuring Rakim) and the drum & bass riffing, John Hurt sampling The Holy Egoism of Genius.